I don’t pay much attention to make-money-online offers nowadays because there are just too many crappy products out there. But when they started showing up in my email a bit too frequent, it prompted me to check and that’s what lead to today’s review. 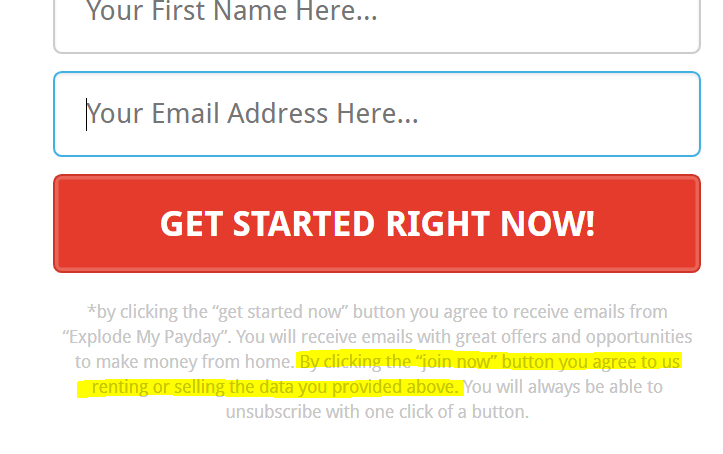 How much of a scam actually surrounds the Explode My PayDay system? It’s not that difficult to find out. Here’s the full exposé. Like most programs with explosive names, this is another digital product one can find on the Clickbank marketplace. That means, it’s commissionable and you’d probably find some online reviews from marketers who are part of their affiliate program. Interestingly, there aren’t many positive reviews and it’s easy to see why that’s the case in a short while. Explode My PayDay is created as a system that can be plugged to your computer or mobile devices to generate traffic from all over the internet. It will then lead to some kind of sales transaction which can generate commissions to you as a member. Apparently, there’s no need to sell anything, so I am guessing the money you’d be making comes from promoting the system itself. The product costs $47 at the front end, but could down sell for $17 if you choose to exit the sales page faster – a typical tactic commonly seen with digital product offers. Even so, I wasn’t convinced about the legitimacy of this product. The system is offered through a sales page and if you watch the entire promo videos, you can pretty much pick up a lot of red flags. In case you are curious about what they have to say, here’s the full clip that I managed to source from YouTube. On the sales page, you’ll see and hear a lot of bogus wordings, crafted in such a way to get your full attention. Using time and money as the targeted pain points, the creator has no qualms lining up these sentences to persuade you that the system actually works. And then, it started ‘showing’ you the money. With the system, the owner has made over 3 million dollars in her account. You could be making at least $1000 per day or potentially, $365,000 per year. 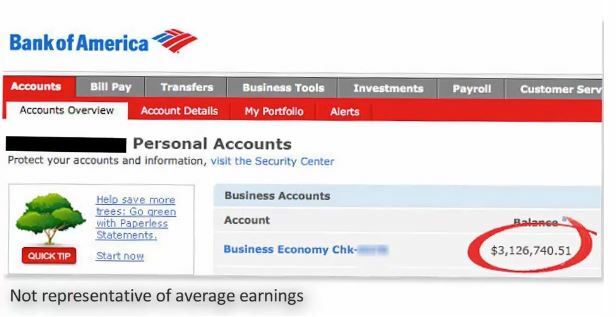 Apparently, people who have never made money online can even do this and turn it into a retirement income. By now, you should be very tempted. And then comes the urgency. “Today could possibly be the luckiest day of your life” because there’s limited spots available. “Only 45 people from 45 cities can get hold of this system” (what??!!) and “you can get paid as early as tomorrow”. But you must sign up before so and so date because the registration will be closing tonight. Yet, everytime you click on the sales page – I checked over three different dates (see below) – they are always ‘closing the registration’. And as if that isn’t enough, the promo video wrapped up by saying “You are destined to become a millionaire.” Wow! Isn’t that good copy writing or what! I don’t know about you, but I am so not buying these claims. I’ve fallen for one before – they were outrageous so I know what the drill is like. The entire time, I don’t have a single clue what the system is all about. The video on the sales page started off with a few people sharing their income success using the system. Some make $1000+ and some $4000+ in a week. Earlier, the creator claimed that she has helped many people achieve financial freedom yet, less than 5 individuals actually shared their testimonials. If you watched closely, the videos were a bit too professional and that was because they were fake. All these people were hired from Fiverr to narrate the exact lines that the Explode My PayDay wanted them to do. They aren’t users – they are just actors. And guess what? The creator by the name of “Meghan Harper” who appeared very briefly on the video, clad with a bikini on a kayak, is actually a female portrait on Shutterstock. Can you spot the difference – or not? So who actually owns this program? We don’t really know, but one thing for sure, it’s a joint venture product managed by Triad Excel Marketing in which one can sign up, get the swipe files and upsell for more profits. Each sale offers up to 70% commission and you could potentially earn more than $200 cumulatively. Now, I was beginning to see why all the promotions for this system is coming through my email. It was almost like I am part of a They were trying to make me buy the first product and later, push more into my plate. Not too long ago, after writing a review about Daily Cash Siphon and Dean Graziosi’s Underground Millionaire Mastermind, I was getting a ton of promotion for Explode My PayDay system for about two weeks or so. I suspected that one of these sites must have given away my email to some kind of solo-ad campaigns, causing all the incoming junk. Even though each of the message was slightly different, all of them have similar links pointing towards the sales page. So when I contemplated signing up for the system to claim my spot – just out of curiosity and wanting to prove my point – the almost unreadable faint print beneath the email column, caught my attention. Now, I totally get it that they want to send me future promotional emails, but I dislike the idea that they are also going to rent OR SELL my data to third parties. My inbox was already bombarded and it’s quite annoying to have your personal email spammed this way. What scares me the most about programs like this is when they boast about a ‘brand new method that requires zero skill and is completely automated’. Every single word in that sentence is a red flag. Whether you are a newbie in internet marketing or someone who’s trying to make more money online – know this. You cannot achieve long term traffic with complete automation technique. And you certainly cannot expect to earn anything without offering something valuable to the human users. Just like most things out there, this hyped system is likely going to send bots to your site and this will ultimately alert Google that you are doing something naughty. Bots aren’t going to enter credit card details – it’s the human users who have that kind of capability. So what’s the point of having spikes of traffic that can’t even convert and then risk having your site being penalized by the search engines? Time and again have shown that all of these automated software never and will fail to work, no matter how advanced they claimed to be. Look, making money online is more than pushing a button. It’s rarely that simple and anyone who try to convince you otherwise, is just trying to scam you. Nevertheless, it’s an achievable task IF you know the right system and the right community to follow. This legit platform taught me how to make my first dollar online – no shortcuts and no dangling carrots. If you are looking for something that works long term, you’ll definitely benefit from their professional tips and training. Feel free to look around and if you need to know or discuss anything else, just leave the comments down below. Well, at least they are honest about saying they may sell your personal data. But you are right about all the red flags. I have been doing internet marketing since the last century. These type of marketers try to launch programs on the cheap to maximize their profits. They sell the dream and then deliver the reality that there is actually no money to be made overnight. It seems like one of the first clues that a program is a scam would be any kind of get rich quick promises.That, and the use of words like “explode” in this case. Sad to say, but people keep churning out these scams because they are making money with them. They are taking advantage of people looking for legit online businesses – sometimes very desperate people. I am glad that you exposed this one. Those people selling and buying people’s data, are scumbags. Gah! I had that happen a few times and I just hated the scammy email offers. I agree with what you said about automation traffic generators and such. These tactics get you slapped by Google, meaning your SEO is useless if you try funky, underhanded tactics to make a quick bucks. Create quality content and you’ll see results. No need for get rich quick program like this Explode My Payday. ClickBank really needs to filter these vendors before letting them sell on the marketplace. 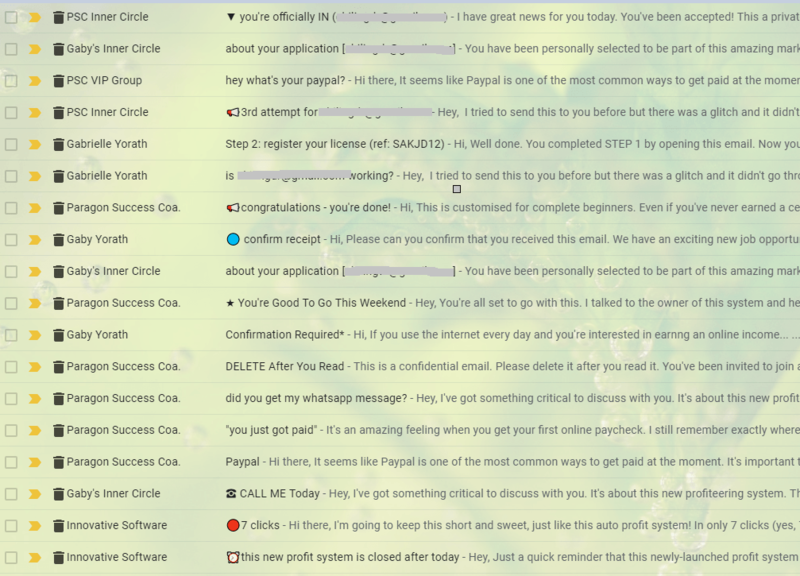 It is annoying to see so many program offers flooding my email recently in which Explode My PayDay is one of them. The name and the persuasive content of the invitation is tempting, but I truly have my doubts. Your review reconfirmed what I saw as red flags so thanks! 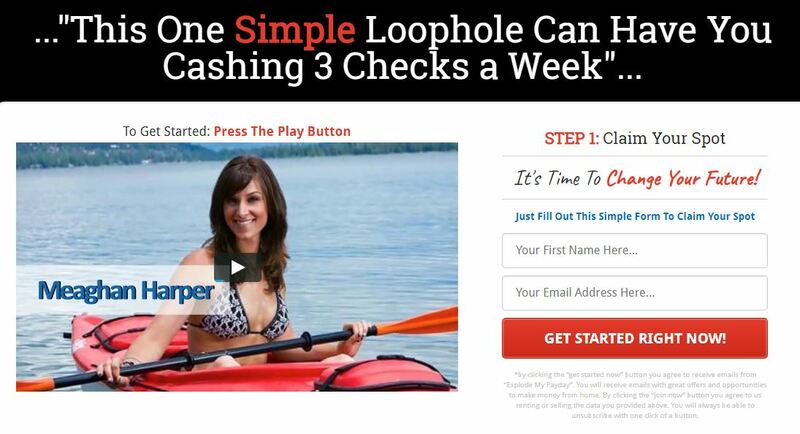 I never learned, however, what is the loophole that would allow me to cash 3 checks per week. From your description it appears that it is some sort of automated software to generate sales and that the money is earned by selling the program to others. It is surprising that many people still fall for these scams. It was a big red flag that you discovered that the person promoting the program was an actor from Fiverr! This is obviously a scam website where they are just trying to get your email address through the sales page. A lot of this is fake and comes from reading a script from people on Fiverr. You saved me time because I was about to pull the trigger until you pointed out these red flags. This is one shiny object you should really stay away from. Your due diligence is commendable and will save a lot of people a lot of money from investing in this obvious scam. It sounds like a pay-me-for-the-right-to-make-money deal and promises impossible things like income without work, just plug in their magic formula and bam, instant freaking millionaire! I am so tired of scams online and glad to know there are people out there fighting the good fight. A lot of scam sites are springing up and laced with fake claims. When the testimonials are unreal, you should be alerted at first encounter. How is it possible that you can make more than three million dollars in a swoop? Apart from winning a lottery, that’s absolutely impossible to achieve online within a short period of time. You would have to steal if you want to do that. There is a lot of platforms out there that claim to make you huge money online so ‘earning 1K in a week’ is nothing new here. I almost fell for something similar not too long ago, but common sense and reading some online reviews saved me from making a costly mistake. As someone who has fallen victim to a number of online scams, I can now spot one from a distance. Based on what you’ve just reviewed, I would give Explode My PayDay a zero. Newbies, don’t even attempt anything like that. The red flags are too obvious with this one. I could’ve sworn I’ve come across a review of a similar product (or the same product) owned by a Meaghan Harper in the past. While I’m not sure if Explode My PayDay was the system at the time, the name rings a massive bell. At the very least, if this is a different system, it’s probably the same system under a different name.